Tumbling down the north side of Mt Somers are huge columns of rhyolite which form one of the best climbing areas in Canterbury. The routes are long and sustained outings up grooves and arêtes up to three pitches high. 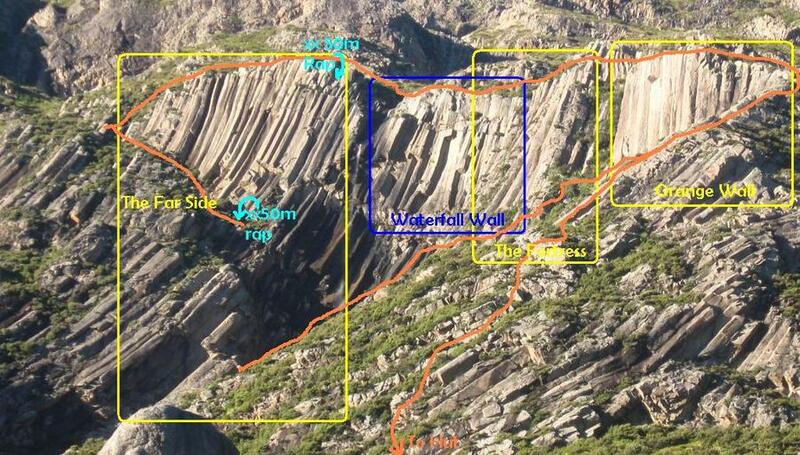 Over the past two years these, together with andesite pinnacles lower in the valley, have been developed mostly by a small group of Oamaru climbers. There are now over 60 routes, grades 9 to 25, with potential for many more. The track to Pinnacles Hut starts from the Sharplin Falls car park. Turn off the Geraldine to Darfield road 5km north of Mount Somers Village (10km south of the Mt Hutt Ski Field entrance) at the Stavely sign, and follow the road across the bridge and turn right to the Falls. The track climbs steeply for the first half an hour over Dukes Knob before dropping back down to the stream bed above the falls. 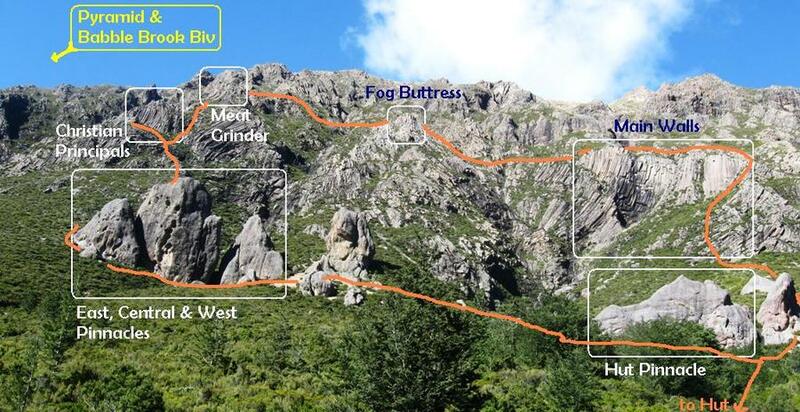 Follow the stream for 40 minutes, then take the sidling path to Pinnacles Hut, about 2 hours or 3 for a slow party. Pinnacles Hut has 19 bunks but is often full over summer weekends and is popular with school parties. From the hut take the path up to the toilet then keep following the track. The climbs start 10 minutes above the hut. It’s 25 minutes to the Orange Wall.